Disclosure: I received the Thomas the Tank Engine™ Bedroom Combo for feature from Step2. All opinions are my own. Mason loves all types of transportation. It's the cutest thing watching him make the sounds while playing with cars, trains and airplanes. He's also an active 2 year old toddler who likes his own things :: everything is "mine" or "Mason's". Guess who was excited to get a mini-room makeover with the Step2 Thomas the Tank Engine™ Bedroom Combo? This is truly an ultimate holiday gift for the little train lover in your life. The combo includes a Toddler Bed, 2-in-1 Toy Box & Art Lid and Up & Down Roller Coaster - all in the Thomas the Tank Engine design. The bed was fairly easy to assemble with a simple screwdriver and a bit of muscle. The frame pieces are sturdy and the one-piece solid slat for the mattress is a must have. Thomas came alive when the decals were placed and Mason was ready for a ride on the rails! Mason enjoy being the conductor while Kenzie has to take the back and be the passenger. There is a small storage compartment behind the smoke stack where he likes to place the current toys in his hand before taking the rein. The smoke stack is also removable and let's just say it gets toted around everywhere! A standard crib mattress fits perfectly so you can easily transition from the crib. 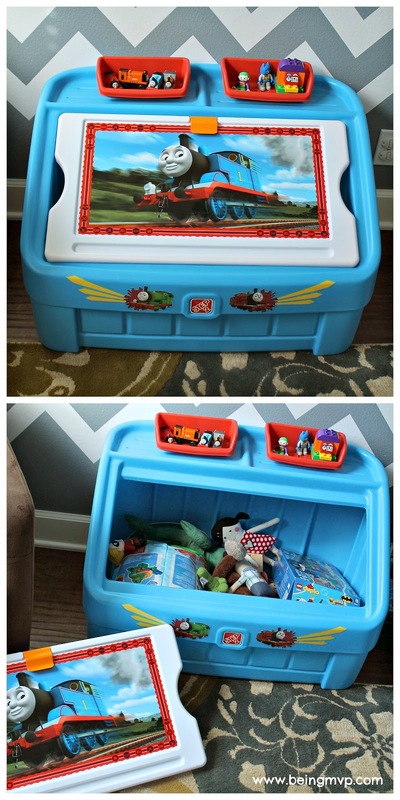 The 2-in-1 Toy Box & Art Lid™ is a nice step-up from soft baby toy bins as your child becomes a toddler. It's a generously sized toy box that can access by simply lifting the Thomas lid which also doubles as a place for your child to get their artistic juices flowing. It has the same art clip that is on Step2 desks and can hold paper in place while your child draws. The two supply containers are great for crayons, markers, toys, etc. Mason has been interested in markers of late so we will have to pick up some that are only "Mason's". What child can resist the Thomas the Tank Engine™ Up & Down Roller Coaster™? There's over 9 feet of tracks to ride and the detailed Thomas the Tank Engine™ coaster car is so much fun to hop onto. Check out the video of Mason cruising! Do you have a Thomas the Tank Engine™ fan in your life? 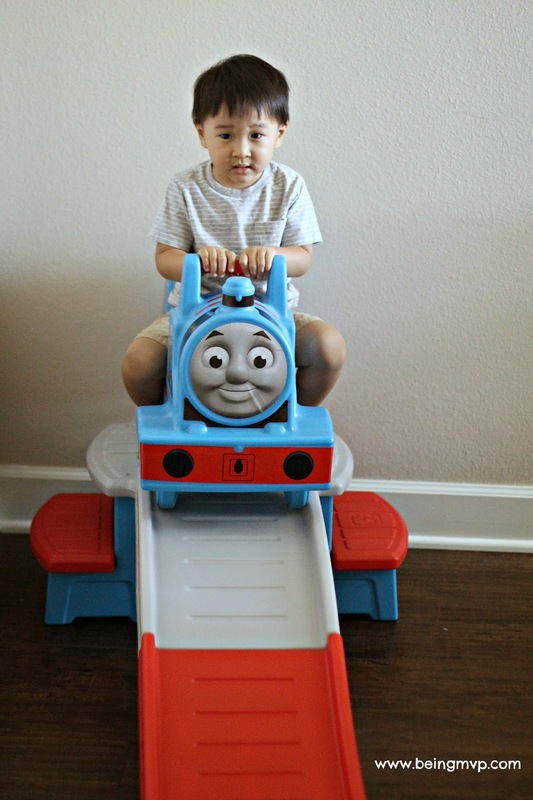 Make sure to come back and enter to win a Thomas the Tank Engine™ Toddler Bed™ in the Blog Pop! Christmas Wishes event! What an adorable bed! My grandson would have loved to of had this before he got his twin sized bed. This is adorable! My son would love a setup like this. Too cute! Now my kids would flip to find that under the tree :) What a great gift idea. Thanks for sharing. Seriously could not be cuter! My tot is totally jealous of this set!!! My nephew would have loved this when he was a kid. He was all about Thomas. Very cute! My son would have loved this when he was little, Thomas was one of his favorites. That is one super cute bed! Any kid would love it! I'm kinda jealous that i didn't have it! What a cute set! I bet this would be a hit with many Thomas fans! That's Thomas heaven right there! He must absolutely adore his room now! that is so cute! I bet my nephew would love that for sure! My son is a huge Thomas fan! He would drove that roller coaster for sure! Such a cute bed! A lot of room too. How cute, what a great set to have. I bet your son loves it! This is a great set. I love the little ride part. My son would have loved this when he was little. OMG, this is a boy's dream come true! :) Love that ramp! What a lucky little boy. I have a 3-year old and he loves Thomas. He's loved to go play over with your son at your house. he is quite the thomas fan. my daughter loves trains so I know that bed would be a huge hit with her. My little Thomas fan already lives and eat Thomas to be able to sleep on him would be amazing for him! I know it would be a lot easier to keep him in bed! This is such a cute bed! My grandson would be over the moon to have a bed like this in his room to sleep in. He loves everything to do with Thomas the Train! Both my kids would love this bed because they are fans of Thomas. I worry about the top part of Thomas jutting out though for safety reasons. My granddaughter loves Thomas just as much as my grandson's do. She would love to have this bed when she comes spends the week with nama. Oh my goodness! This is so cute and I love the practicality! The bed and the storage is awesome! My son is a huge fan of Thomas and would love this! 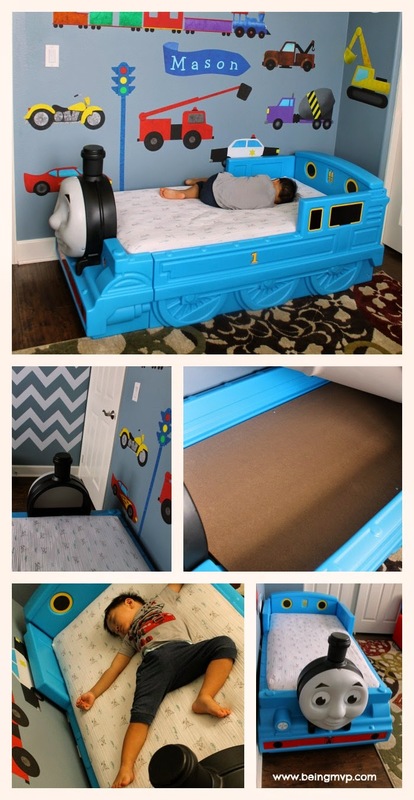 My son would love this-maybe it would make his transition to a big boy bed easier! I love Mason's room- so cute! my kids would SO fight over this but this would be for my son He loves trains and his whole room is trains and cars. I WANT THIS!! How adorable! I think my 5yr son would love this style bedroom. So cute. My son would love this! He will be out of his crib soon. 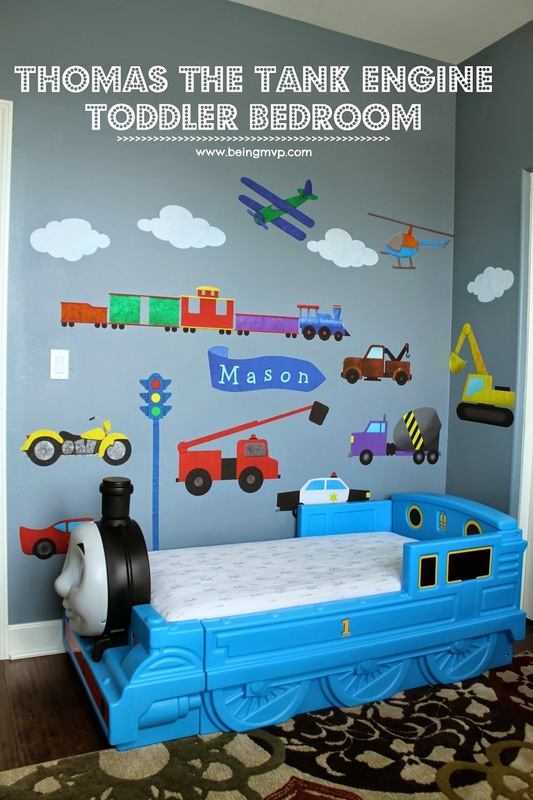 My Thomas fan would love this because it'd be so fun to sleep inside Thomas the train!! My son will be switching to a big boy bed soon and would love this. Um, he'd lose his mind! He loves trains... my son! My grandson would love the detail of this bed, especially seeing the face of Thomas! Who doesn't love Thomas the Train! My 3 year grandson would love this bed. He loves Thomas the Tank engine. My great niece would love this bed. She watched Thomas all the time. This is so cute! My daughter would love this because she loves trains and blue is her favorite color. This is so cute! My son is a huge Thomas fan. He has his room setup with all the trains. My bff's son would looooove this! He's all about Thomas the Train! He would never want to leave his bed ! I can see my son playing on that bed for hours pretending he is a conductor! My daughter would love this, she loves trains! That is an awesome bedroom theme.